Apple Keynote is a presentation software developed by Apple. It is available both on iOS and Mac OS platforms. Initial version 1.0 of Keynote was released in 2003. Apple Keynote is currently available for free both on iOS and Mac OS app stores. 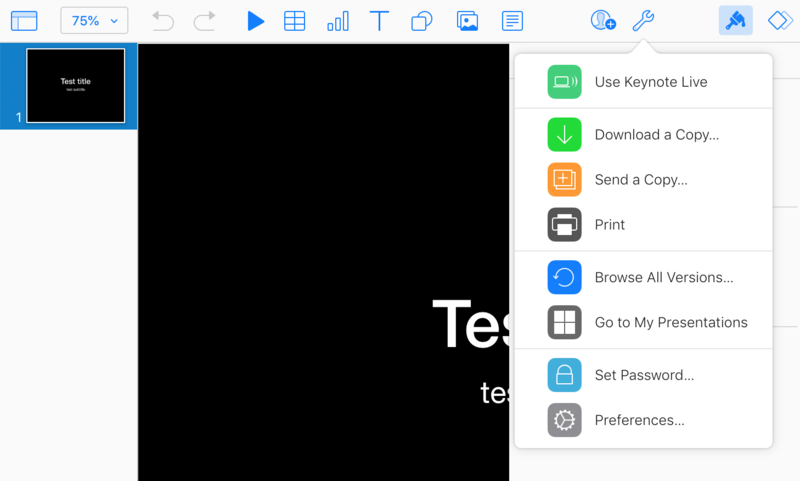 Apple Keynote uses KEY file extension to store presentation data. KTH file extension is also used to store presentation template data. 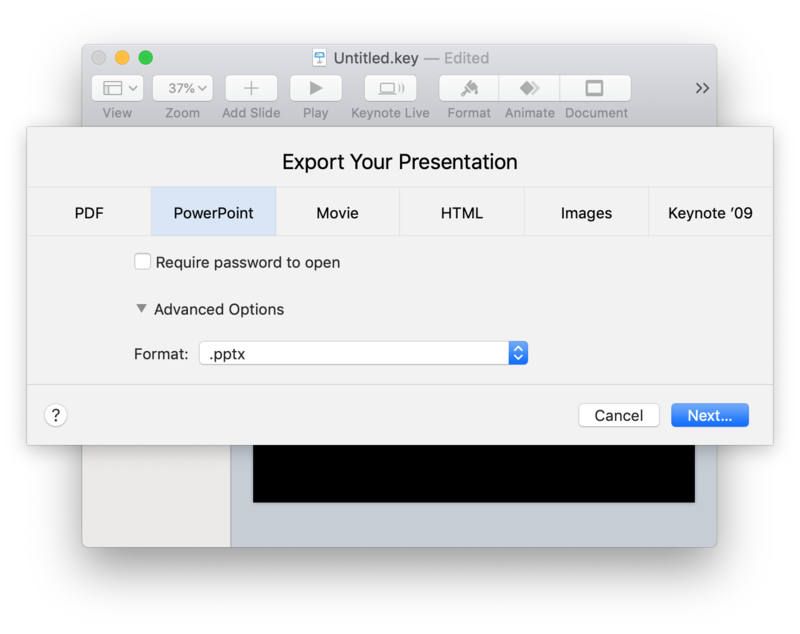 Below we will describe several possible ways on how to convert Apple Keynote presentation to PPTX file which could be read by Microsoft PowerPoint. If you’re working on your Keynote presentation using Apple Keynote for Mac OS operating system you need to select File->Export To…->PowerPoint… in the main menu. You will see the following screen. Click on “Advanced Options” and choose if you want to export to a newer Office Open XML format PPTX or older binary PPT format. If your Microsoft Office version 2007 or newer, PPTX is a better choice. If you don’t have access to your Mac OS computer, you can still export your Keynote presentation to PowerPoint program using iCloud. Navigate to iCloud.com and choose Keynote on the main screen. Your presentation will be either in “Recents” or you can use “Browse” option to find it on iCloud Drive. Double click on it to open. Once Keynote presentation is open click an option icon in the main menu as shown below. After that select “Download a Copy…”. This will present you with a dialog where you can choose if you want to download your Keynote presentation as a PDF file, PowerPoint file or Keynote KEY file. Select PowerPoint and you will see a dialog with a current status of conversion. Once conversion is complete PPTX file will start downloading to your computer. It is also possible to export Keynote presentation to PowerPoint from iOS device. Open Keynote application on your iPhone or iPad. Click on “…” in the top menu. Select Export on the next screen. On the following screen you can choose if you want to download your Keynote presentation as PDF, PowerPoint PPTX, Movie file or multiple images with slides.